As I’ve said before, I haven’t always been a positive person on the inside… It took a lot, I mean A LOT, of struggles and searching to have all that I tried in my attempts to be positive to actually stick. One really important learning was from Rick Hanson, PhD. He wrote a book called Hardwiring Happiness in which he talks at length about “Taking in the Good” and his HEAL Method. See, I was allowing really amazing moments to just pass me by. I wasn’t living in the moment. I wasn’t allowing myself to recognize and hold onto the great things that happened every day. The basic idea of “Taking in the Good” is to be able to recognize something that feels right, soak it in, and take it in a little deeper. Amazingly, it’s the exact thing we do when we ruminate on something that doesn’t feel good… Except that rumination is not positive for our overall well-being, perpetuates more worry, and we burn that negativity into our brains. 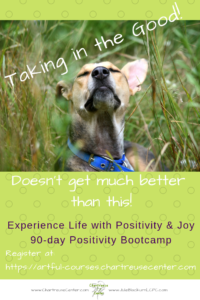 What if we could take that same focus and put it onto something that is positive in our day? I’ll tell you, it’s life changing! There are a number of learnings that have contributed to my joy… it’s just that Dr. Hanson seemed to provide a missing piece… that mental connection that makes the joy stick. I’ll share a few of my secrets with you. It’s really quite simple… At first, it took some intention and observation. I had to open myself up in a new way. Now, it’s just a way of taking in my experiences and observing the world. ❤︎ I start the day with a positive statement. I sometimes pull a quote or use my own statement for the day. ❤︎ I stay aware to my intuitive reactions in my day and what I’m drawn to through my senses. ❤︎ When I’m finding that I’m interested more than just a little, I take further notice of that thing, person, or event by making mental notes of any details that catch my senses. ❤︎ I interact with it in some way or try to capture it – I might take a picture, I may marvel at the colors, I may thank someone for their thoughtfulness, I may draw a sketch, I might even close my eyes and allow my other senses to take it all in. I even share these great things to increase the impact. ❤︎ I allow my mind to drift back to what I enjoyed at another time in the day. ❤︎ If I come upon a tough time of the day, I can repeat my positive statement or pull one from my “Inner Champion” (positive self talk) stash. ❤︎ I look back at the moments through a time of daily reflection – looking at pictures of the day, through visualizations, daily gratitude, or art making. This is usually before I go to bed to set my mind into a positive place for my time of rest. These 7 secrets can be repeated multiple times a day… I encourage that! And it happens quite quickly. As you can see, it’s more than just simply “Taking in the Good.” It’s Living in the Joy! 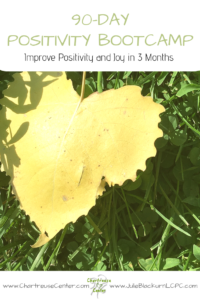 It’s recognizing the tough times and having ways to bounce back to a place of contentment or focus. The great thing is that I’ve already done the work… and I’m happy to share it with you. 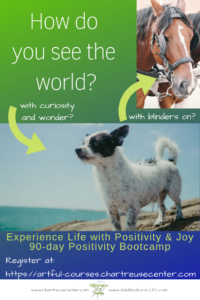 Now, these are just a few of my secrets… I’m going to teach you these 7 secrets and even more during the 3 months together through the 90-Day Positivity Bootcamp. This course is only offered twice a year and is limited to100 participants. Take advantage of the 40% Early Enrollment discounted pricing now. Enroll now.